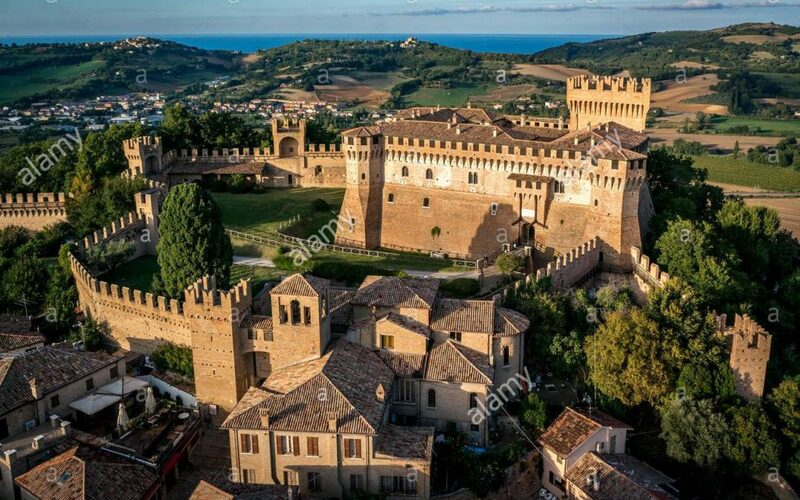 Every tim e we drive across the border which divides our region, Le Marche, from Emilia Romana in the north we marvel at the imposing castle perched on the cliff edge above. We vow that one of these days we’ll check it out, but northbound we’re always on a mission to get back to the UK or to the ski slopes or whatever and southbound we just want to get home. Last Sunday however we spent the night in Rimini barely half an hour away, so we decided to check out the castle on the way back. Climbing up to the small town of Gradara we were relieved to discover that it sits on the Marche side of the divide. The main street in the medieval walled town climbs past bars, restaurants and souvenir shops to the entrance to the 11th century castle surrounded by 800m of fortifications. It is easy to see why this spot was chosen as a defensive location. With the foothills of the Apennine mountains behind, it overlooks a narrow plain, the main navigable path along the Adriatic coast. It isn’t just the medieval warring factions including various popes, dukes of Rimini and Florentine clans who have shed blood attacking and defending this region. In 49bc Julius Ceasar made history, just a few kilometres away, when his illegal crossing of the Rubicone river, north of Rimini, led to the start of civil war in the Roman Empire; and somewhat miffed Brutus! The action giving rise to the expression “to cross the rubicon”, the point of no return. 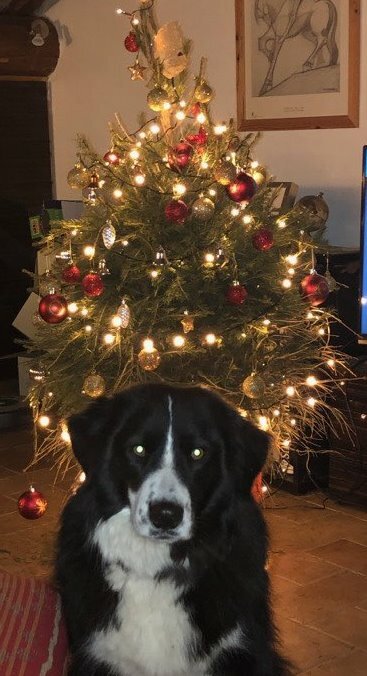 Buon Anno, tanti cari auguri. Bob, Ian, Obi, Sofia and cats. It has been a harsh winter here in Italy, as in much of Europe, and like so many people we have been looking forward to Easter and the start of spring. The difference is that unlike our friends further north we are now enjoying real spring weather. Yesterday we took the dogs for a much appreciated walk along a still deserted stretch of beach in glorious sunshine then enjoyed lunch at the coast while the dog’ slept it off in a shady spot. If your plans to dust down the barbeque and spend Easter in the garden have been thwarted by the weather then maybe you shouldn’t risk the rest of the spring being washed out. We still have availability for May, including both of the UK bank holidays, with its light evenings and promise of a glorious summer ahead, it’s one of our favourite times of year. And remember that we are happy to accommodate short breaks, midweek arrivals and for those that can’t face the anti-social hours of the flight to Ancona don’t forget that the one to Perugia leaves slightly later and is often considerably cheaper. 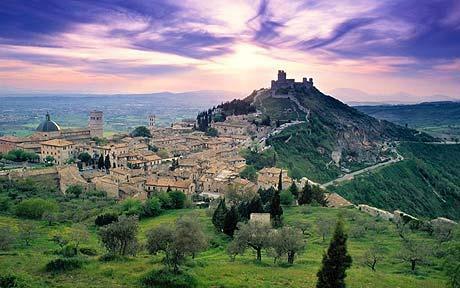 Only about 80 minutes away the simple drive from Perugia airport takes you past the UNESCO World Heritage city of Assisi. Over the winter we have been thinking hard about what further steps we can take to make Casal dei Fichi more environmentally friendly. Many years ago a dear friend persuaded us of the futility of drinking bottled water, it is heartening that slowly the planet is realising the damage that plastic is doing to the environment, the atmosphere and particularly the oceans. Sir David Attenborough’s Blue Planet episode did a fantastic job of demonstrating how grave the problem has become. 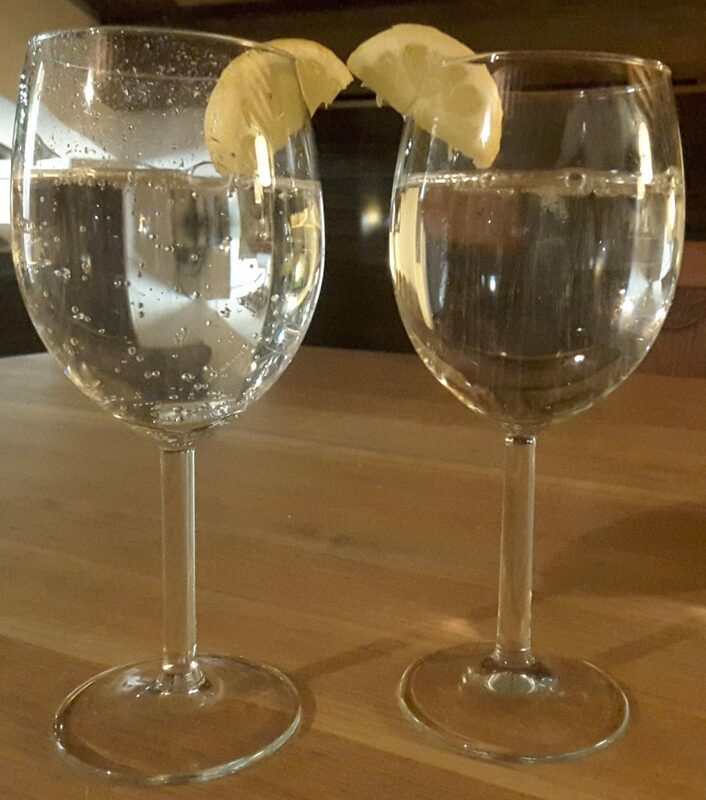 As fans of sparkling water we solved our dilemma by investing in a simple carbonating machine which turns still water into refreshing sparking water, as subtle or intense as you choose. This year we have equipped all of the apartments with these machines. Made in Italy it’s also good to know that they haven’t travelled half a continent to get here. 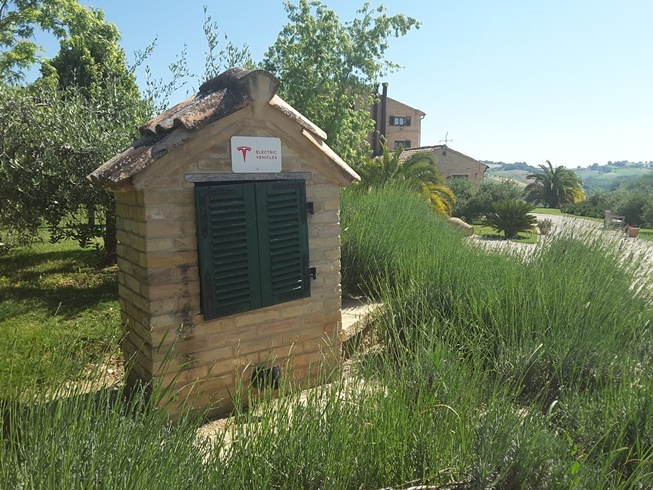 Our tap water comes from the Sibillini mountains that you can see from Casal dei Fichi and is absolutely safe and refreshing to drink, however for those that prefer the additional security each apartment now has a water filter jug. Shabby Chic? CdF’s new look. With only one remarkable exception nobody has ever complained about the lack of air conditioning at Casal dei Fichi. Fly screens and louvred shutters mean that our guests can enjoy a good night’s sleep. Our original shutter supplier let us down and gave us the wood for nothing, so we set about making them ourselves. 12 years on most have been refurbished at least once, the summer sun and winter rain have taken their toll; so now we have ordered replacements from a local company who specialise in these things, they’ll be fitted in April. 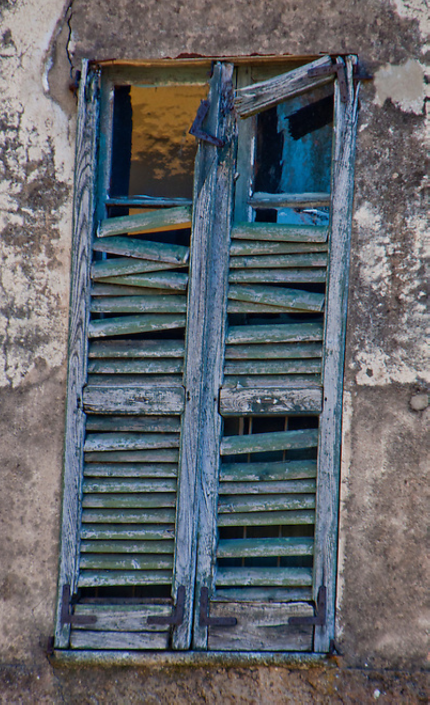 For those of you who have always wanted to own a little bit of Casal dei Fichi we are delighted to offer you a special FREE SHUTTER WITH EVERY BOOKING (subject to availability). Now you don’t see that every day! 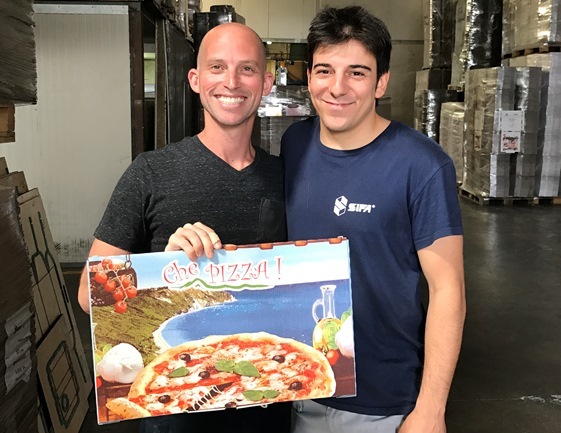 Matt meets Paolo, Francavilla FC captain and manager, at our local pizza box factory. We’ve been keeping a secret since June. Well we’ve told a few people, quite a few probably. Earlier this year Casal dei Fichi was chosen as one of a handful of properties to be featured in a pilot tv series highlighting holiday rental business which stand out as excellent. We were thrilled to have the opportunity to introduce the crew to some of our favourite activities and places. With just 3 days filming our greatest challenge was to decide what to leave out! Our schedule ranged from truffle hunting in the mountains to one of our favourite coastal walks that very few locals know. Being a keen sports fan and football player we arranged for the presenter, Matt, to achieve his ambition of meeting the local community by training with Francavilla F.C. 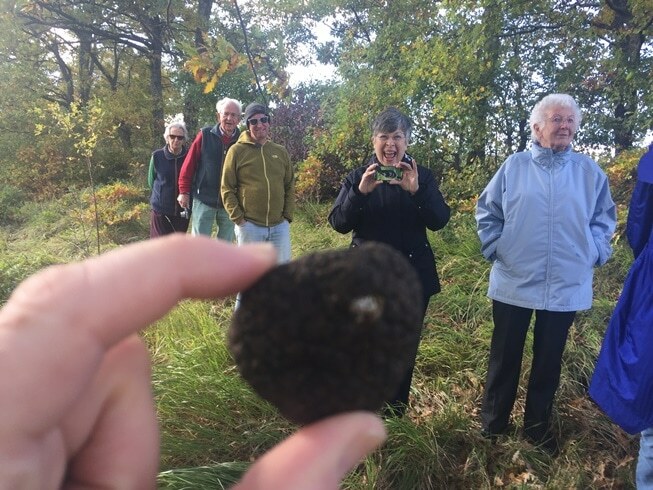 With memorable meals at La Botteguccia del Campo enjoying the truffles we gathered and exquisite Osteria del Baffo with stunning views over the Adriatic we treated them to the best of mountain and sea cuisine. Inbetween we snuck in the Michelin featured Le Logge, a proud participant in our Treedom scheme. And to prove that Marche produces some of Italy’s finest wines, not only did we pick up our wine for the pizza party at Muròla, we enjoyed a tasting of their fine wines as well. Did we mention pizza party?, well what visit to Casal dei Fichi would be complete without one. Just in case the weather was unkind we asked our friend Emanuelle from Mymarca to recommend an interesting indoor activity. His suggestion of an artisan shoemaker represents one of the most important industries in our region. Though his introduction to charismatic Pepe was a revelation to us. 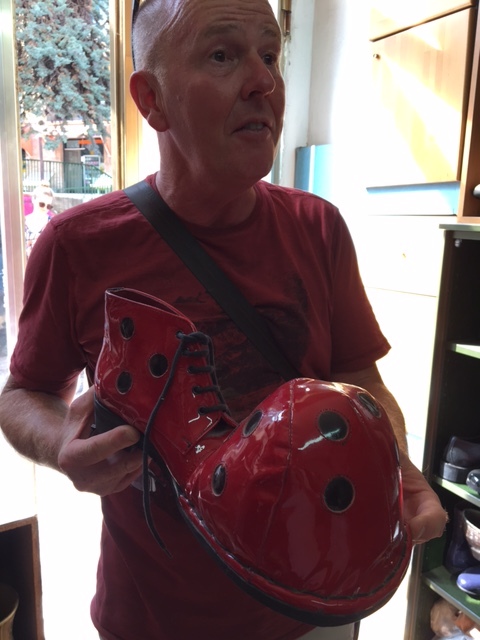 This native of our village still makes shoes to order in his tiny higgledy piggledy workshop, specialising in meeting the global demand for clowns shoes! Unfortunately the sun didn’t stop shining so the footage wasn’t needed. Matt Landau, the presenter and driving force behind the series, is a recognised authority on holiday, or vacation rentals. 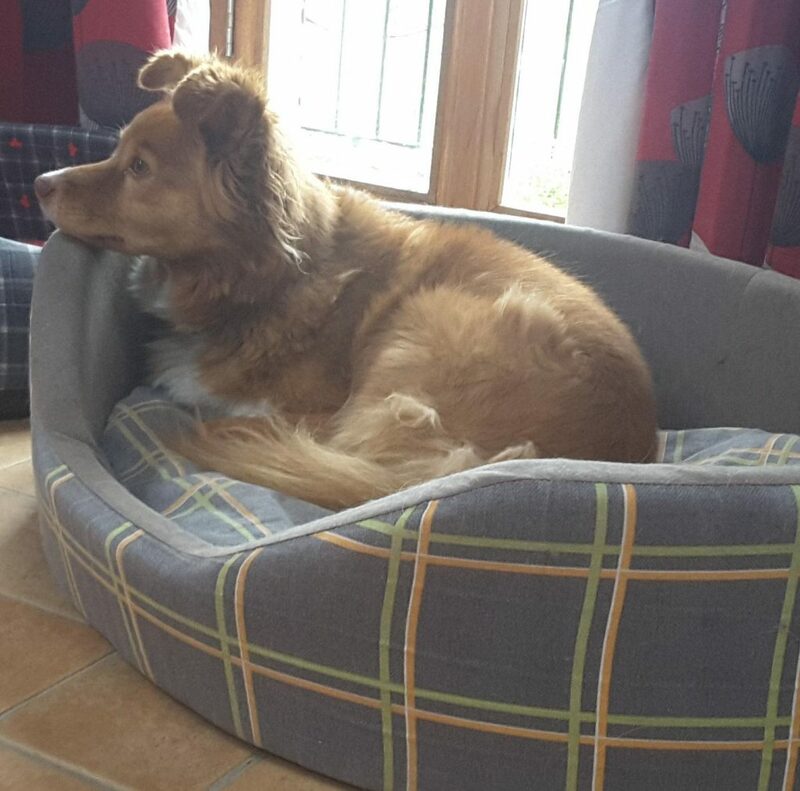 Co-starring were dogs Jakes and Obi and our 47 year old Alfa Romeo Spider, all supporting roles to Marche, la protagonista! So now the secret’s out, click here to discover everything. It must be a sign that the climate is changing as the ultra traditional Italian country folk are now picking their olives earlier than ever. 13 years ago, when we first gathered a meagre crop from our neglected trees November was considered the traditional picking month, some starting after the All Saints’ Day on 1 November, others waiting until San Martino on 11th, the day for opening that years’ new wine. The press would run well into December, sometimes right up to Christmas Eve. Those visiting their Italian country estate to harvest their olives during the British half term holiday in late October would have to carefully schedule themselves around the one afternoon that the odd press would open that week. Jakes and Sofia down tools for a rest. This year the summer was so hot and long that the olives started maturing early in September and by mid October the fields were littered with people anxious to enjoy the autumn sunshine and gather up their bountiful yields. An added bonus being the ability to pick for longer as daylight wasting time hadn’t even begun. Hot dry weather is the nemesis of the flies that lay their larvae in the olive so there was no chance of the blight which devastated previous harvests. 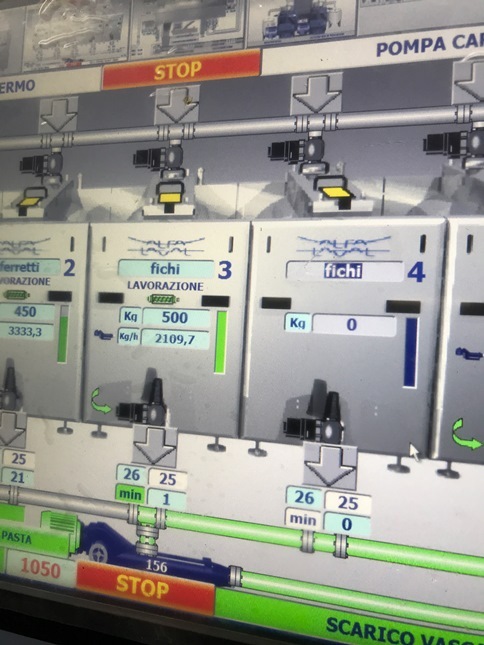 Our local press installed state of the art processing equipment this year and was challenged to open earlier than tradition dictates, with a few teething issues they made it. Producing the oil in a closed environment limits the opportunities for it to react with the air so keeps it fresh. The down side is the loss of the giant granite grinding wheels which transform the whole olives, stones, skins and all, into a pulp. As well as being mesmerising to watch, the time consuming process produces the most wonderful aroma which used to fill the whole building. 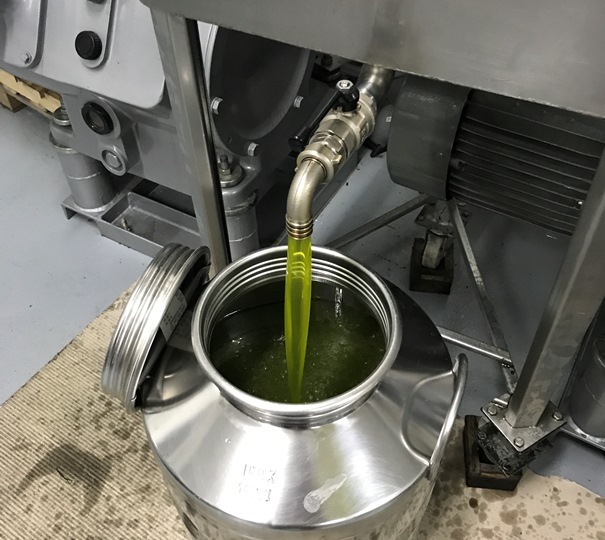 But the process of crushing the olives, churning the paste then separating out the water in a centrifuge has not changed and the oil still emerges, almost fluorescent green, from a single tap into the motley collection of containers which the customers have brought along to take their oil home in. We started picking our olives last week, assisted on the first tree by the guests on our gourmet weekend. 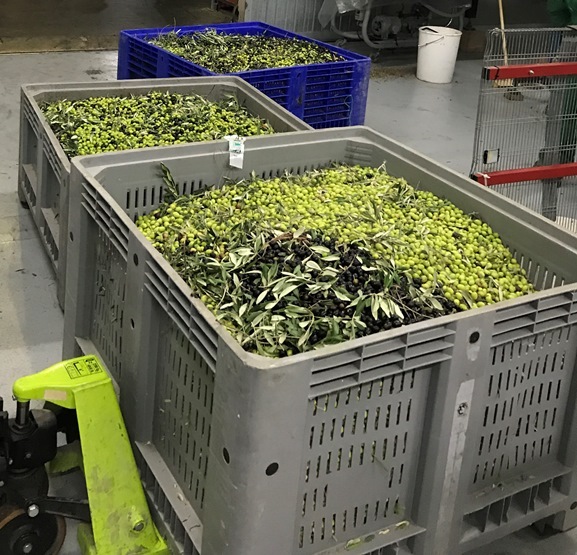 Friday evening we filled 2 cars with as many olives as they could carry and took 900Kg to the press, emerging some time later with about 100 litres of ultra fresh oil. For staunch traditionalists the older process at the press has been maintained, always known as the “old press” this room still has the granite grinding wheels and the stack of circular once straw, now nylon, mats sandwiching the paste is built up to over a metre in height. This is loaded into presses over 60 years old to have the oil squeezed out. When you tire of monitoring your oil’s progress on the computer monitor you can still stroll through be hypnotised by the grinding wheels and fill your lungs with the wonderful smell of fresh olives. Though only in November. Now that most people are about to have, or maybe have already had their summer holiday it may be time to line something up to see you through the autumn. Something to make those Monday mornings bearable. Coming at the end of October when the weather is usually still very pleasant our Gourmet Breaks are a great way to get away for a few days of delicious indulgence. From the minute we meet you at the airport you can switch off and leave everything to us, we’ll take care of all the driving, menu selecting and ordering. Though if you have particular dietary requirements or preferences, we’ll make sure they are provided, vegetarian and vegans gladly catered for, or if you’d just like some more of that delicious pudding or wine – it’s no problem. On the last morning as you head home you will wonder how you managed to do so much in 4 days yet still feel as if you’ve had a relaxing break. From the magnificent Sibillini mountains to the dramatic Conero coastline, wine tasting in the beautiful golden vineyards to seeing the olive harvest being processed in the brand new press, you will enjoy a fascinating insight into Marche and its delicious and varied cuisine. We still have availability from 27 to 30 October when the weekend starts at Perugia airport. 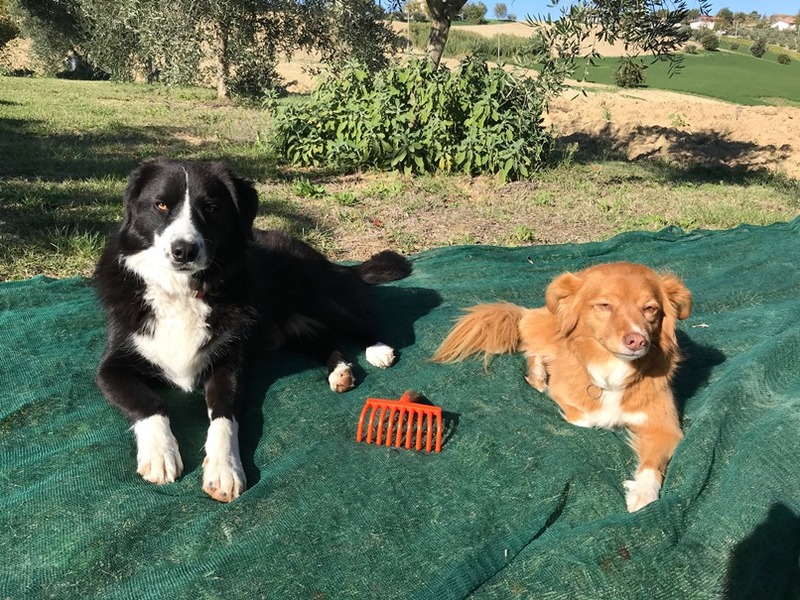 Passing Assisi we take you straight to the heart of the mountains for a gentle walk with the cutest truffle dog and you can watch her expertly and gently unearth the precious tubers. Lunch at a quirky local restaurant features fresh mountain produce with those very truffles. Maybe it’s because of the amazing weather we’ve been having but other people are planning even further ahead. Many of our regular guests have asked us to book them in for next year. If you think you might be planning a visit to Casal dei Fichi in 2018 then please bear in mind that we are pretty heavily booked for June and July and August is starting to fill up too. We hate to disappoint people, particularly our loyal guests, and just wanted to make sure we’d let you know. Finally, for those who aren’t able to plan ahead, we do have some space in late September and October this year, so if you are looking for some late summer sun our pool will still be open and is solar heated. Not a complaint you hear often and not one we make seriously. It’s just that the winter is when we have all those jobs which we are meant to do during those endless months and now, our first guests are here and we keep on thinking how much easier it would have been had we had a few more weeks or days, or even hours to get everything ship-shape. But we made it, well just about. Being on hand at Casal dei Fichi means, of course, that travel is practically impossible when guests are here. So our closed months are when we catch up with friends and family and spend some time in London to get our exhibition and theatre fix. The beautiful, but devastating, mountains. Once again November saw the end of the season here at Casal dei Fichi with our gourmet weekend breaks. 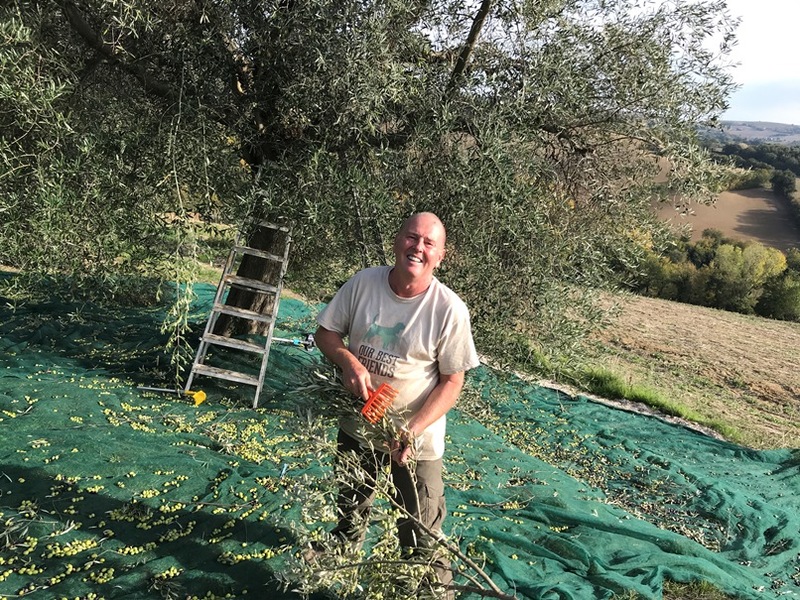 Loosely themed around the olive harvest we always try to vary them slightly from year to year, to introduce new places and experiences that we have discovered and provide a bit of variety to our regular visitors. As Perugia airport is now so easily accessible we began the first weekend by meeting our guests there. With an hour to fill before lunch we stopped on the Marche / Umbria border for a walk in the beautiful countryside through the Sibillini mountains where, in a glade of oaks, Cristine and Danielle from La Cerqua explained the basics of truffle hunting, ably assisted by their delightful Lagotto Romangnolo pedigree “truffle hound” Spuma. 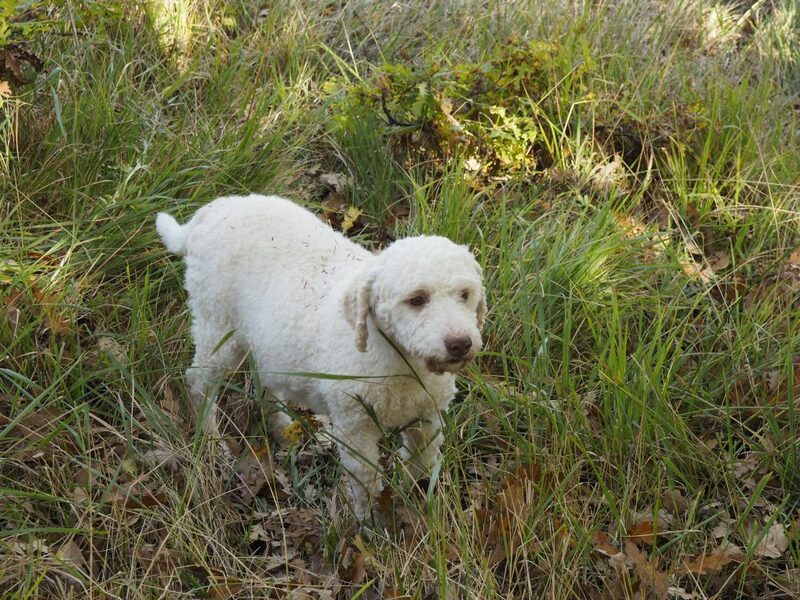 Soon she started scratching around the trees and found some tiny tubers – the training and instinct clearly paying off. Later from the denser undergrowth she proudly emerged with one, and then another, black truffle. Although across the border from Marche you have to admit that Umbria has its fair share of lovely towns: Spoletto, Gubbio, Orvietto and Todi, to name but a few. And whilst there is certainly no denying its beauty, Umbria is the only region on the Italian peninsular which is totally landlocked. Now however eastern Umbria finds itself an hour closer to the coast. It is true that the Adriatic is slowly edging inland, in the time that we have been here we have seen houses succumb to its advances. That might have shortened the journey time by a few seconds. A night at the opera. The chorus against the medieval walls in Norma. A box gives a good view of the stage, handy for people watching too. 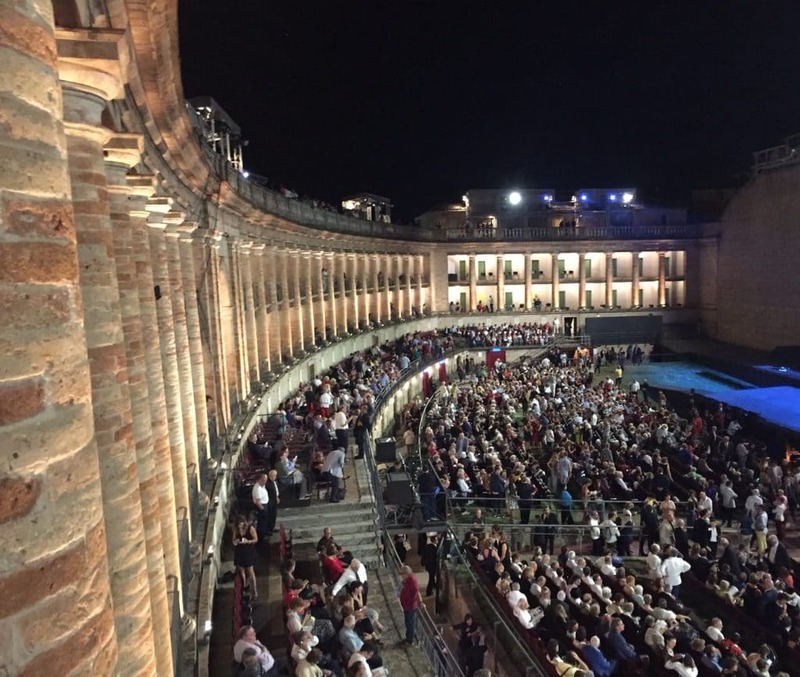 One of the highlights of our summer is the Macerata Opera Festival. Every July and August three productions, generally of Grand Opera are staged in the magnificent Sferisterio Opera House. Built originally for the game bracciale, where a ball was played against a long stretch of the ancient city walls using menacing spiked gauntlets, the building is now used for more urbane purposes. We like to book a box with 4 friends and enjoy the spectacle with a civilising drop of prosecco which you are welcome to bring into the building. This year we attended Norma, above, and Il Trovatore whose gloomy plot is made cheerful by Verdi’s lively music. Copyright ® 2017 Casl dei Fichi.